A chocolate brownie layer topped with peanut butter cookie and Reese’s peanut butter cups! That’s how you make Peanut Butter Brookies! Brookies are one of my favorite desserts. It’s what I make when I can’t decide if I want brownies or cookies. Normally I make brookies using chocolate chip cookie dough. But today, I had this incredible craving for peanut butter and chocolate. Anyone else ever get this craving? 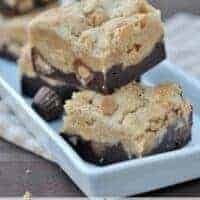 The cure for this craving was to make an over the top dessert combining my favorite brownie recipe with my favorite peanut butter cookie recipe. And throwing in some Reese’s PB cups, of course! The dark rich chocolate brownies on the bottom of the Brookies is the first step to creating this ultimate dessert. I love using this brownie base on it’s own or topped with butterscotch and KitKats. It’s fudgy and rich and just perfect in every way a brownie should be! I topped this brownie base with peanut butter cookie dough. Soft and chewy peanut butter cookies. On top of a brownie. With Reese’s mini peanut butter cups. Must I repeat myself? These are amazing. I refrigerated the cooked and cooled Brookies before cutting. 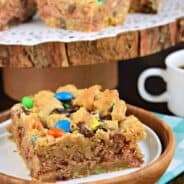 It helps you get perfectly square cookie bars, with beautiful lines. And that’s important. Because a cold Peanut Butter Brookie tastes just as delicious as a room temperature one, you decide how you like to eat yours!! Just don’t forget to have a cup of milk nearby. It completes the meal. A chocolate brownie layer topped with peanut butter cookie and Reese's peanut butter cups! That's how you make Peanut Butter Brookies! For the brownie layer, melt chocolate chips with butter for 1 1/2 minutes in microwave safe glass bowl. Stir until smooth. Add sugar, flour and eggs and combine completely. Pour into a 13x9 baking dish lined with parchment paper. For the cookie dough, beet crisco with butter. Beat in milk, vanilla, sugars, peanut butter and egg. Add flour salt and baking powder. 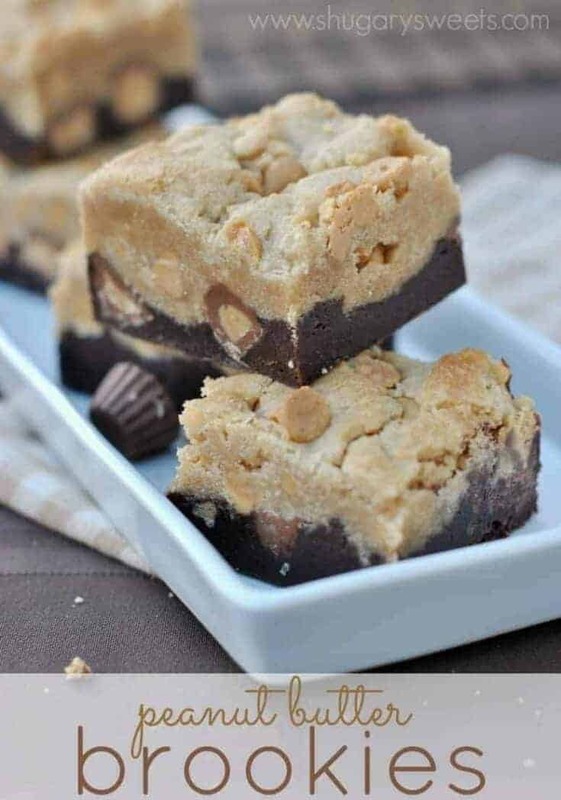 Fold in peanut butter morsels and Reese's mini PB cups. Drop cookie dough onto brownie batter layer. Smooth evenly. Bake in a 375 degree oven for 35-40 minutes. Remove and cool completely. Refrigerate and cut into bars. Craving peanut butter and chocolate? 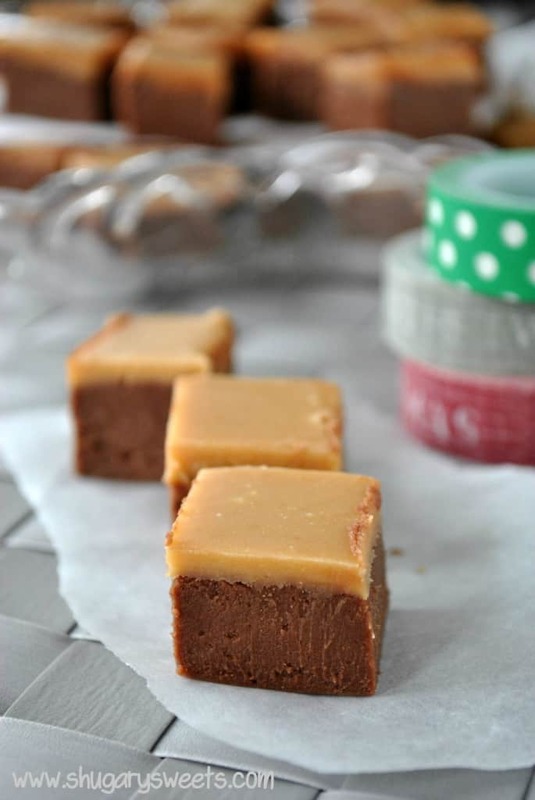 How about some Chocolate Peanut Butter Fudge? 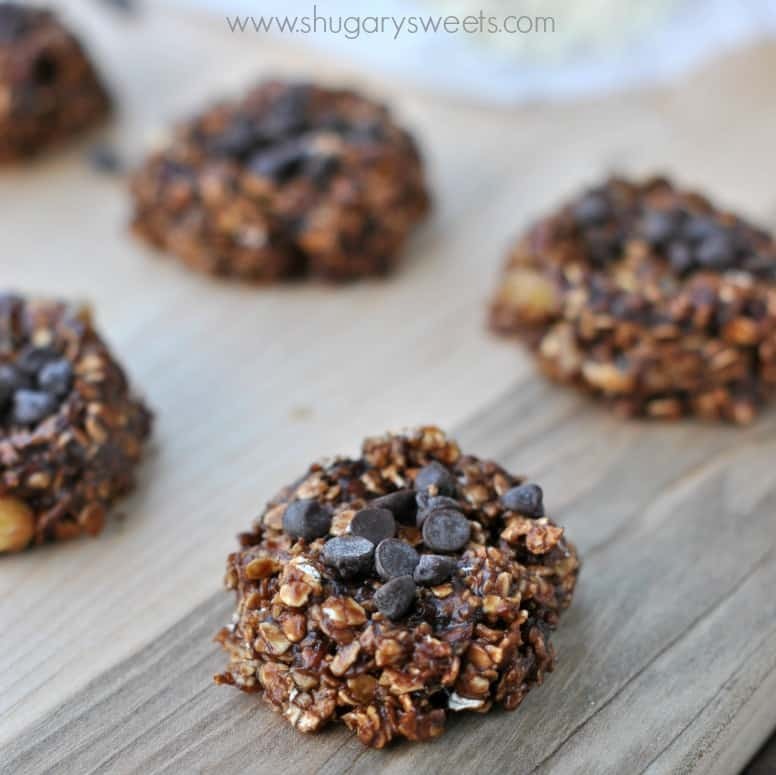 Maybe a batch of these SKINNY Chocolate Peanut Butter NO BAKE Cookies are the answer to your cravings? 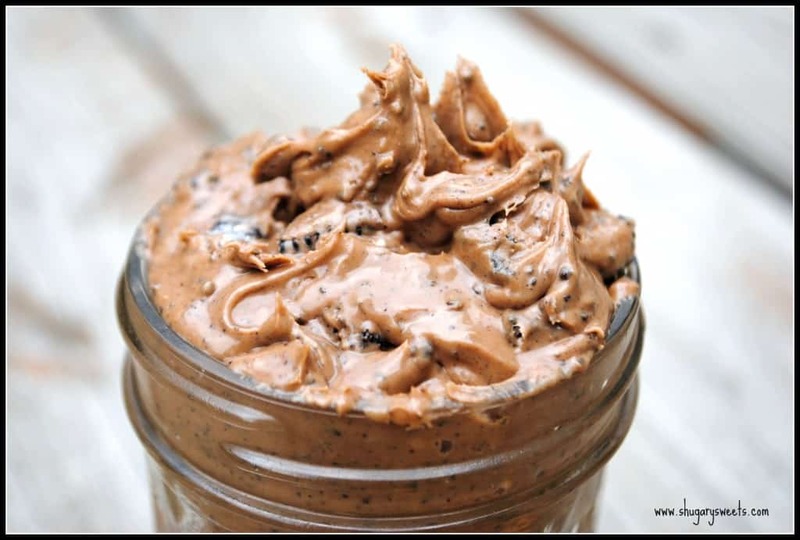 Oreo Peanut Butter Dip: a treat on a spoon, and the perfect hostess gift! These Reese’s topped Fluffernutter Rice Krispie treats are a delicious solution to your cravings too! 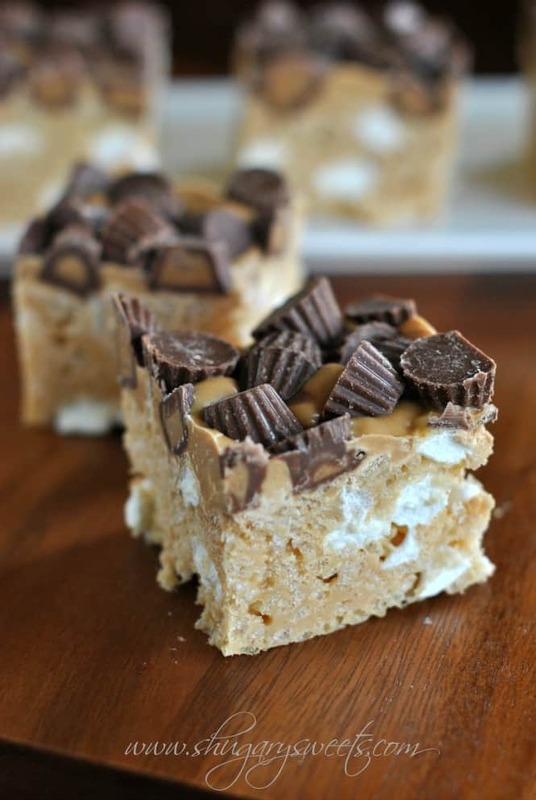 More delicious Peanut Butter and Chocolate Recipes from Blogs…. I only get that craving alllll the time!!! These look ohhh so good! Rich and chewy and nomnomnom! Ha! I know the feeling. These bars are the cure for ya! Be still my heart! These are perfection and I need them NOW. That gooey, sliiiiightly underbaked patch in the peanut butter cookies is my siren song. 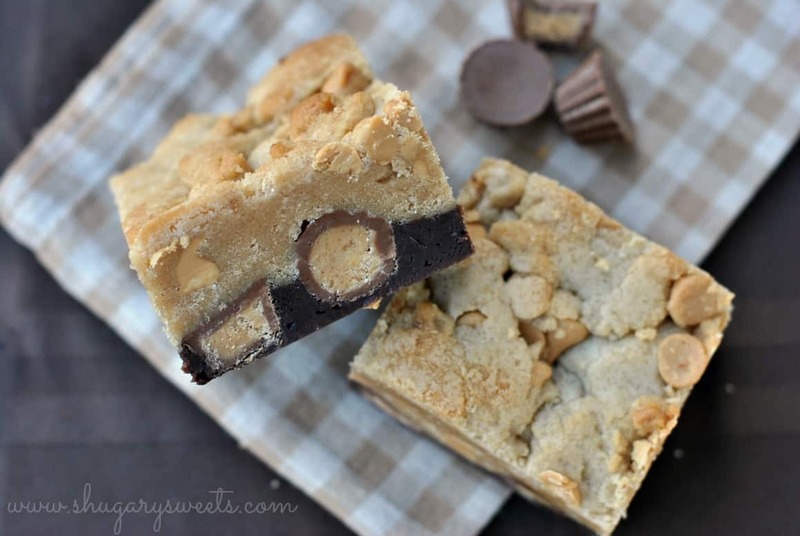 Oh, and the fact that a peanut butter cookie is baked on top of a freakin’ brownie. Genius! Just saw these on Foodgawker and stopped dead in my tracks. These look SO amazing. 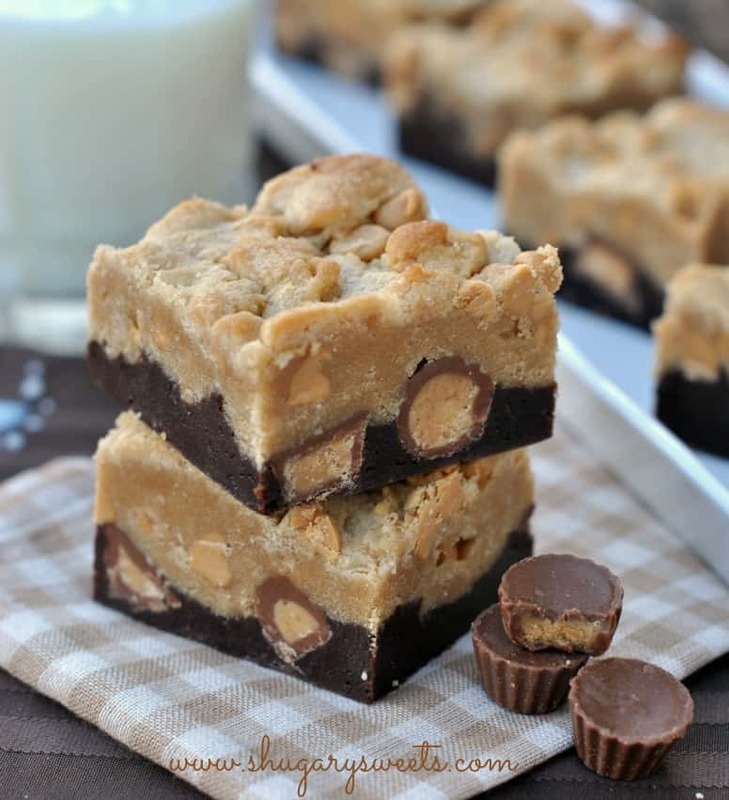 I just love layered cookie bars like this…especially when it’s chocolate and peanut butter! Peanut butter and chocolate is pretty much heaven. I love that there are peanut butter chips and peanut butter cups. I think I need to eat a hundred of these. Thanks!! I lthink a lot of people feel the same about chocolate and peanut butter!! Oh Aimee I want to devour that whole pan right now! Great Brookie and I am pinning you!!! Wowie, these attracted me on google. My little boy was beside me when I saw, and he was drooling over these. Looks delicious. Glad you both enjoyed them. I hope you give the recipe a try!! Awesome, as usual. You can’t go wrong with peanut butter! Thanks Dorothy. Peanut butter and chocolate are two things that always work! Oh myyyy, these look phenomenal! Favorite flavor combo EVER. These look great, and I am not even a peanut butter fan! These look amazing. I’ve made your brownie base before and they are fantastic…but don’t they have cocoa? Is this base different? Oh my GOSH… When it comes to treats, there really isn’t a better combo than chocolate and peanut butter. Your brookies look AMAZING and I can’t wait to try them! Thanks Becca! Let me know if you give them a try, they are delish!! Never herd of a brookie, but I think I want one! Love your photos too! Oh wow, these look yummy. My craving for peanut butter and chocolate is never ending!! What an absolutely drool worthy bar! I could put a serious dent in that pan of goodness!!! Love that you shared a Reese’s recipe today too 🙂 We could put a dent in the pan together!! Wow! I will be trying these, but converting to Aussie ingredients! My kids will think they’ve died and gone to heaven, the little peanut butter junkies! Haha, I’ve got a set of peanut butter junkies myself!! ENJOY! A tall glass of milk please, because this takes me right back to primary school – awesome! Clearly I’ve never thought of doing this! Wow! Reese’s have always been my favorite candy so this is a no-brainer! I get the chocolate and peanut butter craving a lot! These look so delicious! Oh my gosh I’m in love! Where has this brookie been all my life? 😉 I have been craving Reese’s Peanut Butter cups for like the past month and my husband is getting tired of my chocolate/pb creations. Lol. This famous duo never gets old to me. Definitely going to make these! My husband was a little tired of all the lemon and citrus, so these were right up his alley!! 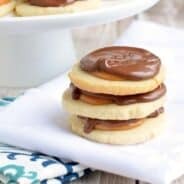 These are the perfect cure to a peanut butter and chocolate craving! These brookies look amazing! How decadent! They look fantastic! Wowzers, I think I could eat the whole batch of these myself. These look so good! Thanks Ashley, they were quite good! It’s stuck in my head now, thankyouverymuch!! Chocolate and peanut butter perfection! They look amazing! Wow, these look so rich and absolutely divine! I definitely get the peanut butter/chocolate craving – it’s one of the best combos! This recipe is awesomeeeee! Yummy! These look gorgeous! Thanks for the recipe! Wait – I’m confused! Did you make these with the brownie recipe and peanut butter cookie recipe you said you used, and linked to? Or is the pictured bar made with the recipe further down the page? They don’t match. I’d like to make them so they look like the ones pictured. Hi Dee, great question! I actually used the recipe in the recipe box, I made a few alterations to get the consistency and texture I wanted. ENJOY!!! Ok – I see . . . I think. The recipe in the recipe box is the altered version to get the ones pictured. Thanks for your quick response! I can’t wait to make these next week. Oh my gosh! These look amazing, super indulgent 😉 I love it! I noticed you use a lot of crisco in your recipes. Crisco isn’t something I normally use, could I use butter instead? You can definitely substitute unsalted butter for the Crisco. I occasionally use Crisco when I’m looking for a certain texture! ENJOY! Oh my goodness….anything with peanut butter and chocolate makes me drool! This looks amazing! I’m stopping by from Tatertots & Jello (#79 Budget Bathroom Makeover) Have a great weekend! Oh my goodness…. these look divine!!!!!!! What a great idea!!!! They sound absolutely delicious!!! I thought you’d like to know that I found these on a facebook link that wasn’t yours. I went back to look for them, couldn’t find it, googled you and arrived here. They had tweaked the recipe, but were using your photo. I just pulled my batch out of the oven, and it smells awesome. Wow! I want one of this pronto! So yummy! These look amazing! I don’t get peanut butter morsels here in Germany, do you have an idea how I can replace it? 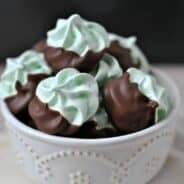 I made this recipe and it was wonderful! All of my co-workers loved them! Sinfully delish! I baked them for 35 minutes and the top got a little brown, but they still tasted great. I would just keep a closer eye on them and bake them for a shorter period of time. Crisco is shortening. Here in US they have butter flavored. I baked these for a bake sale and they went over quite well. I agree that the bake time should be less than 35 min as mine were a tad crunchy on top…awesome recipe! 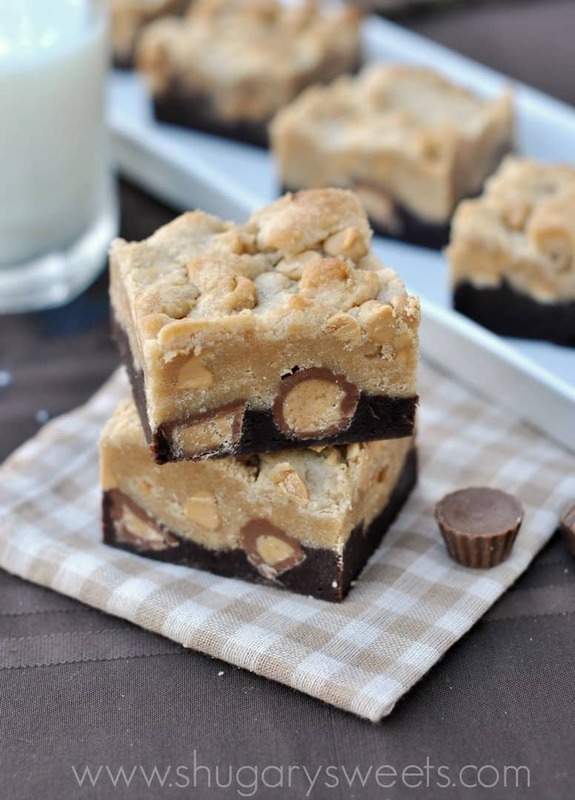 Pingback: Peanut Butter Brookies: brownie base topped with peanut butter cookie… | bingoa ! These are absolutely delicious. I have tried a brookie before and gave up because the brownie part was gooey and the cookie was dry. So I tried this recipe and baked it in my pampered chef stone ware 9X13 pan. It tasted good, but did not look like yours. The only changes I made to my recipe was to use all butter and no Crisco and a variety of chips instead of Reeses PB cups. The brownie was slightly gooey, but the cookies was slightly overcooked especially on the edges. Do you think next time I should cook the brownie layer for about 5 min. then top it with the cookie layer? Would 350 degrees work? Should I use a glass pan instead?I really love brookies and would like to find a way to make it work so I’d appreciate suggestions. Thanks for the delicious recipe. I too have Pampered Chef stones, and find that bars like this need a longer baking time. The crisco DOES make a difference in the cookie base, so switching to all butter will make a slight difference in the browning part too. What can I use in place of Crisco? Made these this weekend. They were perfect in every way. We were a house divided… I liked them room temp but my husband like them cold. Either way, delicious! Thanks for sharing, so glad you enjoyed the recipe!